flavour, tender texture and high meat content. Ranging in size from 1 to 2 lbs., Atlantic Snow Crab is an excellent source of protein, as well as being low in fat and calories and its beautiful shell colour will surely impress. Our premium quality Snow Crab is caught by local independent harvesters through a Trap Fishery located within 175kms of our processing facility in the pristine waters off of Canada’s East Coast. Because our crab is fished by trap and delivered live to our processing plant, the freshness and quality of the product is preserved until it reaches our customers. Over 15 vessels annually supply our plant with 6+ million pounds of fresh live crab which we process into cooked brine frozen clusters/sections and market under our “Grampa Harvey” brand. We follow the most stringent Quality Control Practices. Our facility is federally registered and inspected. Our HACCP based Quality Management Program is approved by the Canadian Food Inspection Agency. 3rd party audits are performed annually. 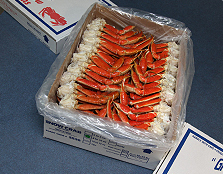 Every container of finished crab is tested by our in-house lab prior to shipping. We have full traceability of product from arrival at our plant to customer delivery.